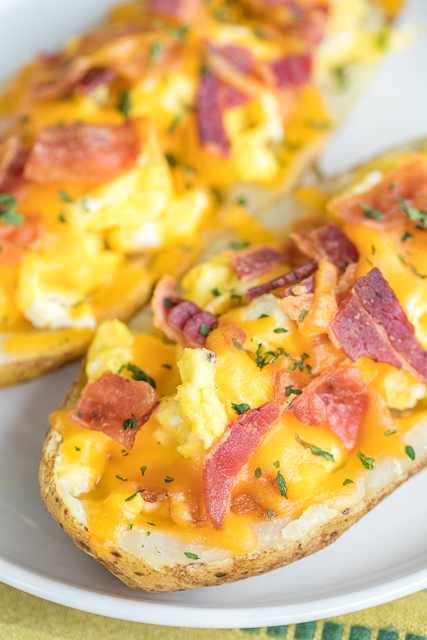 Potato skins loaded with eggs, bacon and cheddar cheese. Can make the potatoes ahead of time and finish off in the morning for a quick breakfast. Everyone LOVES these! Can customize with your favorite toppings - sour cream, salsa, green onions. The possibilities are endless! 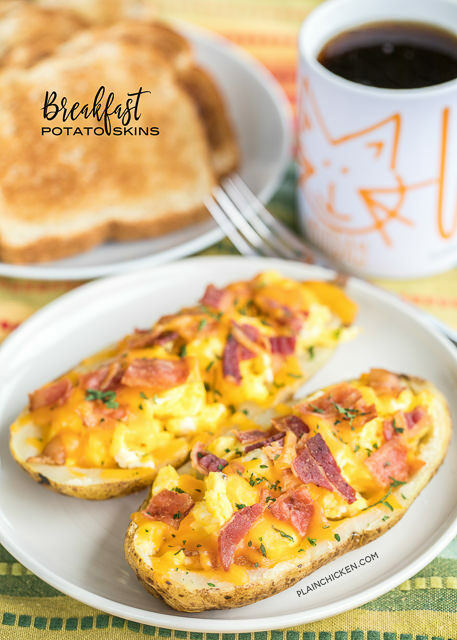 These Breakfast Potato Skins are a great way to start the day! 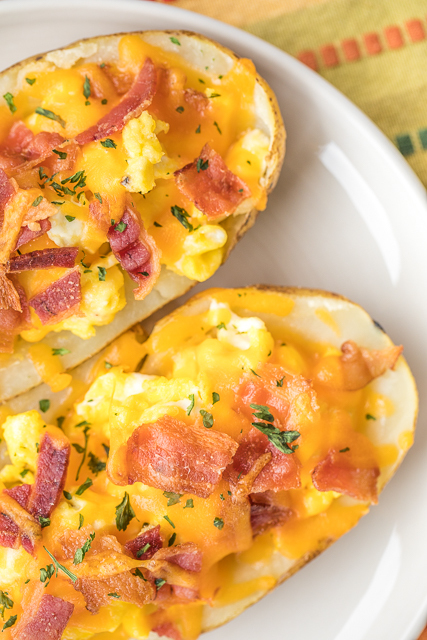 Baked potato skins loaded with eggs, cheese and bacon. YUM! The best part is that you can bake the potatoes ahead of time and stuff them with all the goodness in the morning. Perfect for those of us that want to eat breakfast but don't want it to take all morning! I used cheddar cheese in these Breakfast Potato Skins, but feel free to switch it up with some pepper jack, muenster or swiss. We just ate the potato skins plain, but you could jazz them up with some sour cream, salsa, green onions. The possibilities are endless!! All you need is some toast and fresh fruit and you have a fabulous breakfast that everyone will love. Wash potatoes throughly. Dry and poke 10 to 12 deep holes in potatoes with a fork. Coat potatoes in oil and sprinkle with salt and pepper. Place potatoes on baking sheet and bake for 1 hour. Remove from oven and cool. Beat eggs in a bowl. Season with salt and pepper. Add eggs to skillet and scramble until done. Set aside. Increase oven heat to 475ºF. Once potatoes have cooled enough to be handled, cut them lengthwise and scoop out the pulp, leaving about 1/4 inch layer of pulp in the skins; discard pulp. Place potato shells on baking sheet, cut side down, and bake for 8 minutes. Remove from oven. 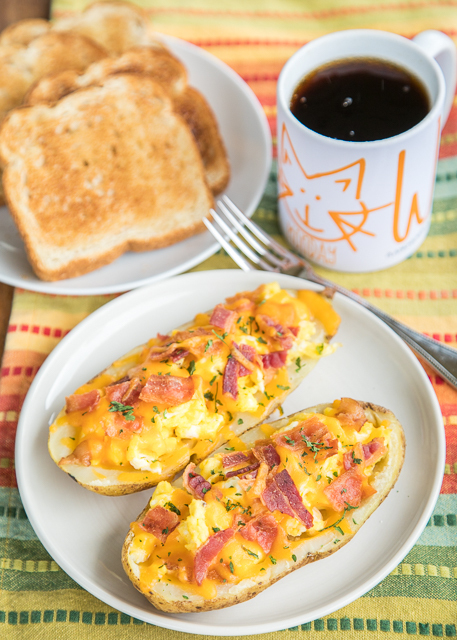 Turn over potato shells and fill with cheese, cooked eggs and bacon. Bake for an additional 2 to 3 minutes, until cheese is melted. What a great idea and they look awesome. What!? "discard pulp." Uhm, make 2x Baked Potatoes out of it? Eat it, mash it, anything, but waste all that beautiful Potato> I generally don't comment, but What?